Can we all just agree, Italian ice cream is to die for? I moved to my neighbourhood in 2015, which was when I realised that Madrid had a Little Italy – actually it’s so little that very few Madrileños are aware of its existence. Get lost in the area bordered by the calles Rios Rosas, Santa Engracia, Raimundo Fernandez Villaverde and Jose Abascal and you will discover Italian restaurants, pizzerias, delis, cafés and, best of all, DaROMA. 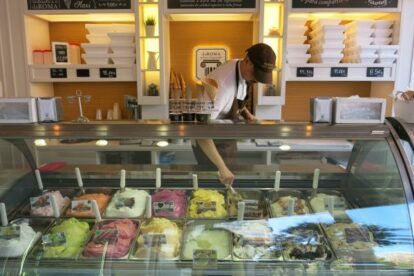 DaROMA stays open all year and ice cream flavours change daily. I’m a creature of habit, but am happy to go out of my ice cream comfort zone for a creamy new experience! Now it’s colder you can enjoy a crepe, cake or hot chocolate. although the star of this place is gelato. Choose a cup or (yummy) cone; the real challenge is picking what flavour to have, but don’t worry if you can’t decide. They let you sample a little spoonful to help you make your mind up. There are the classic Italian favourites like nocciola (hazelnut) and stracciatella (cream with chocolate shavings), as well as more modern ones, like strawberry cheesecake, banana, cookie and peanut butter. Many claim to be the best, but DaRoma is my personal favourite.